Today a few kids had their dreams come true and they left the annual Pony Auction the proud owner of a genuine Chincoteague pony foal. Nine year old Emily Kemper even got some help from a stranger in the crowd, who contributed the extra $100 she needed for her winning bid. And two lucky kids were given ponies through the Feather Fund — Click through to read about Carollynn Suplee. It’s a great story. The Feather Fund continues work begun by Carollynn Suplee, assisting deserving children with the purchase of Chincoteague Ponies. We believe raising a foal teaches children life lessons, including responsibility, good care, love, and ethics, as well as the concept of giving back to others through the care and training of his or her animal. The auction is run by the Chincoteague Volunteer Fire Department. Each year the department picks one “buy back” pony to be auctioned off for charity. This year it was the Virginia Special Olympics and the 3-month old pinto filly brought in $8,100 for the cause. 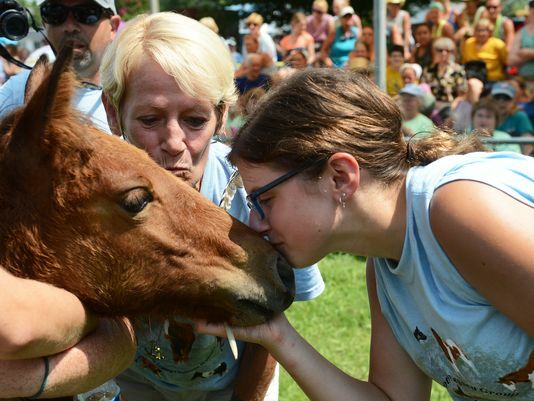 In total 59 ponies were sold, bringing in a total of $151,575. The highest selling pony went for $11,000; the lowest for $550. The money raised helps support the ponies and will go toward building a new fire station. So, you might ask, what’s a buyback? Buyback ponies are auctioned off but are returned to Assateague Island to replenish the herd. The are pre-selected by the Fire Department. This year there were six buyback ponies auctioned off for a total of $45,800. They included the two of the highest priced ponies — two three month old fillies who sold for $11,000 and $10,000, purchased by the Chincoteague Legacy Group, which was founded as a way to unite lovers of Chincoteague ponies. The average age of the foals sold was 2.9 months. The youngest of them will not be available for pick up by their new owners until they’ve gotten a bit older. As for the ponies that didn’t get sold? The herd (and the buybacks) will be swimming back to Assateague tomorrow. These are photos from the 2014 auction. As you can see, some of those ponies are feisty! he results of the pony auction are in. The lowest price was $550.00.